Getting older is often characterized by a loss of relationships. Friends and family die. Hobbies are abandoned. Neighborhoods are traded in for nursing facilities. Time is a wicked thief indeed. But Ole Kassow believes that time can't take everything away—especially the simple joys of sharing a story and laugh with another human being. 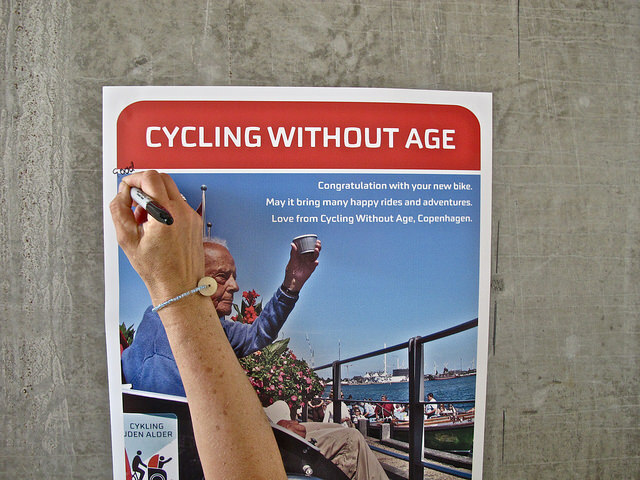 Ole is the creator of Cycling without Age, a non-profit that gives elderly people and people with impaired mobility the chance to “feel the wind in their hair”. Essentially, Cycling Without Age connects people who’ll pedal a bicycle—known as pilots—with people who want to go for a ride. It’s a simple idea and perhaps that’s why it has caught on in 28 countries and 800 locations in just four years. “There are a lot of stories to be shared through storytelling from our elders, but also from us. They want to listen to us too and through this bridge we form relationships. We take our time, and the act of cycling slowly helps us take in the experience and appreciate it." Ole started the program in 2012. 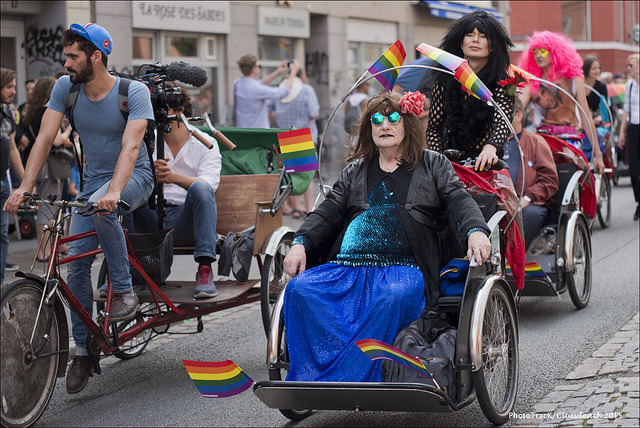 He expected to give rides to a few nursing home residents in his native city of Copenhagen. He didn’t expect to have tons of volunteer pilots spring out of the woodwork to join him. Or to have the city purchase five more of his custom trishaws to help expand the program’s reach. But the most surprising result has been the relationships formed through Cycling Without Age—from romantic flings to improved family ties—the bike rides have resulted in restored youth, new friendships, and community partnerships at a scale beyond Ole’s wildest expectations. Ole took the time to sit down with Relate and talk about love after 80, and the reason bicycling can help you live forever. In your TEDx Copenhagen talk you said that cycling is the happiest form of transportation. What is it about bicycling that makes people happy? Part of it is the fact that when you are out cycling, you get to use all of your senses. The sense of smell, the sense of sight, and of listening to the birds and bustle in the city. That gives this whole ambiance around the ride, which means it's a very stimulating experience. We find that maybe in the hours before our passengers go out riding, they are sitting in a nursing home being under-stimulated, being sad, or being in a state where actually nothing happens. Then suddenly they are out on a bike ride, they get stimulated, maybe see things for the first time in many years. That is the beginning of forming a relationship between the young people and old people. You said that when we grow old, we lose the stories of our lives. How is your program helping to extend people's stories? I was having a conversation with an older lady who said to me that she felt as if she was disintegrating. That she was kind of disappearing from existing, Although she was still alive, what she meant was that she was losing all the people that she grow up with or went to school with including her colleagues or her husband. All of her contemporaries are suddenly gone. Those are all the people that she had those experiences with. She said, "It's almost as if they weren't real anymore because I don't have anyone to share my experiences with." What I found several times, it happens almost every time I am out cycling with someone new and we start talking about their history, and they explain maybe that they had a spouse who maybe died several years ago. They talk about the children and where they grew up. I get the feeling that retelling these stories gives them an immense sense of satisfaction, because suddenly those stories are brought back to life. They are interesting to other people again. 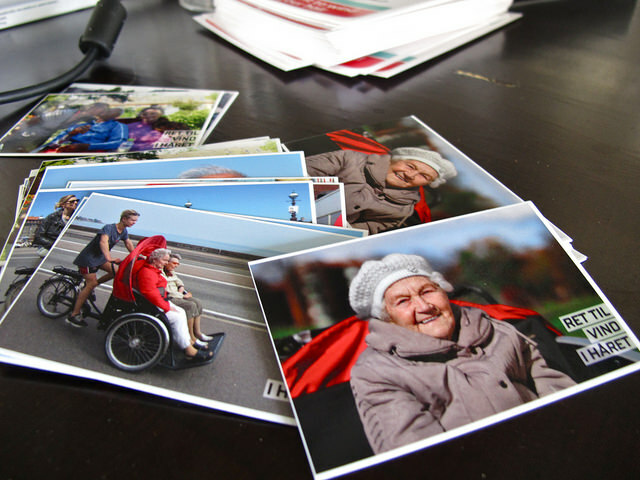 By sharing their stories, elderly people can stop the disappearing process. I certainly myself, suddenly feel that I am connected to another era in history. Do you think it really helps, to be cycling around places where they used to visit when they were younger? Yeah, it does. There was a lady, she died about six months ago, but she was 99 and 8 months when she died. She suffered from dementia. She could talk forever about the old days but she couldn't really have a conversation about anything in present day. Whenever we were out cycling, we were in the old days. I would pretend that we were back in the 1940s or the 1950s and we would have a ball! She would be very happy about it. I think very often we have a tendency to tell dementia sufferers, "No, no Gran, it's not 1952, it's 2015." I think that’s a misunderstood way to deal with it. For people suffering from dementia, it doesn't really matter if the facts are wrong. They have an illness causing difficulties inside their brain, that is the fact, and we can help them get the most out of their time here. If that entails pretending we're back in 1952, then that's wonderful. What about the ambiance of the bike ride helps the passenger and pilot to break down social barriers and start talking? 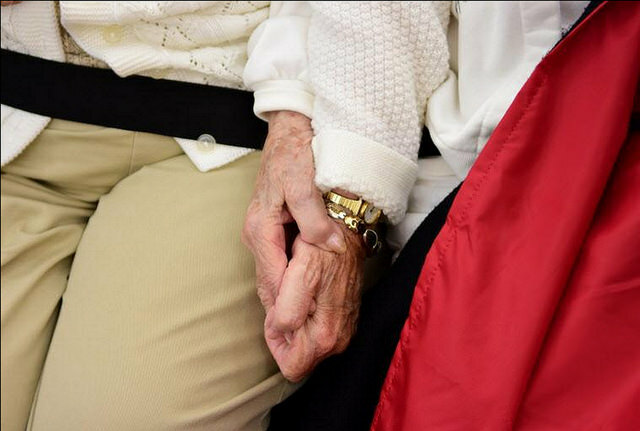 Some people who visit nursing homes find it difficult to come in, sit down, and look another person in the eyes and talk for hours. We have a lot of riders who don't talk a lot. Some of them have even lost their ability to talk. 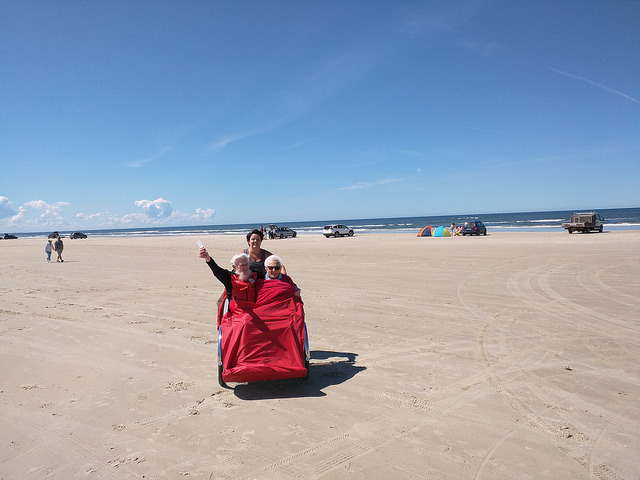 We find that being on the trishaw, where two or three people are on the ride, and you're all facing the same direction, you are sharing an experience without needing to talk the whole time. People find it to be a very comfortable way to be together. Just the fact that you're having an experience with another human being, is extremely important in terms of providing happiness. How has your program impacted the communities it is in? The more quality relationships you build and that criss-cross in the local community, the more trust we get as a whole because people start to know each other. What actually builds distrust? You see it in communities where groups of people don't know each other. They have negative thoughts, thinking "these people are like that". If you give people who are in nursing homes the opportunity to go out and be part of the local community, and you go out and do shopping or sit in cafes, or go to the cinema, you will start to build those relationships. Just by being around and visible you will start getting people interested in offering their voluntary services and going out, doing these rides. They will build fantastic relationships. All these fantastic relationships that are being built, boost the trust in the local community on an epic scale. You can get almost tired of talking about all the positive aspects that come from increasing trust in a community. Crime rates can go down. People become happier. When people are happier, the families will be happier, children are performing better in school. You have this whole expanding effect of building trust in local communities. 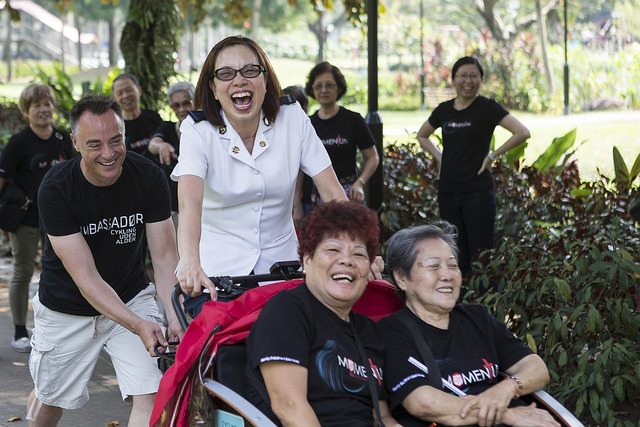 Does witnessing elderly people enjoying life shed a happier light on aging for you? Yeah, I definitely think so. There is this idea that that life stops at 75 or 80. What I know now is that no matter how old you get, there is still something to be learned. 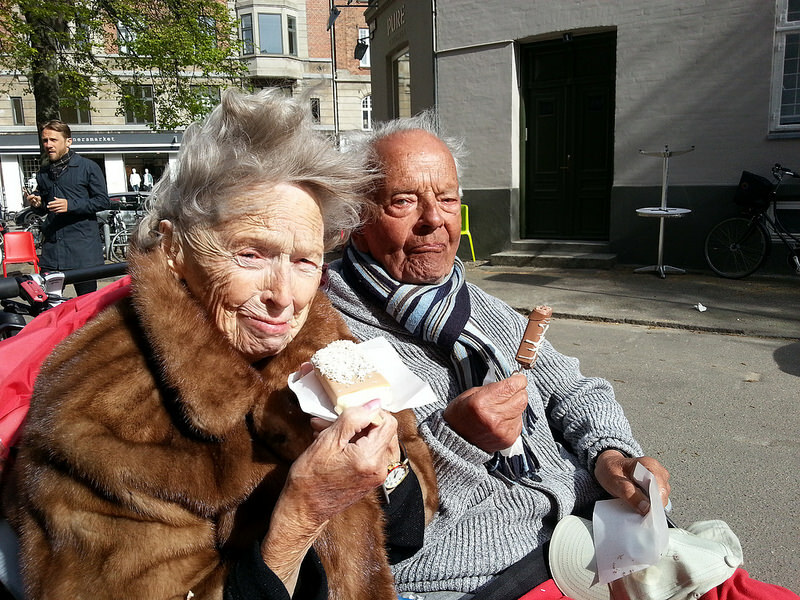 There's a lady who was on a long ride to Norway, and she's 96, Mariel. Before we left, she said to me, "This might be my last trip." You could understand that someone who is 96 is thinking that, "Maybe this is the end of what I'm doing." But then she came back from the trip completely overwhelmed by what she'd experienced. She said, "Now I am planning my 100th birthday, and I want to go on one of these long rides that year. "That's going to be my celebration!" Old people, they can still learn how to paint watercolor or whatever it might be. There are also people that we ride with, once they start seeing that we use the mobile phone to take pictures they adopt the behavior. There was one lady from Jutland in Denmark. After one of these long rides, she decided that she wanted an iPad because she'd seen all the things she can do. Now she's on Facebook and in this whole community tool. She's in her late 80s. I always wanted to believe that life can be a series of positive experiences, discoveries, and new relationships right up until the time your body decides that it’s time to depart this world. Now I think that is definitely possible. One size fits most. Well, that depends with customer service.